One of the visual and auditory gems of the Finger Lakes region of upstate New York (USA) is Taughannock Falls. 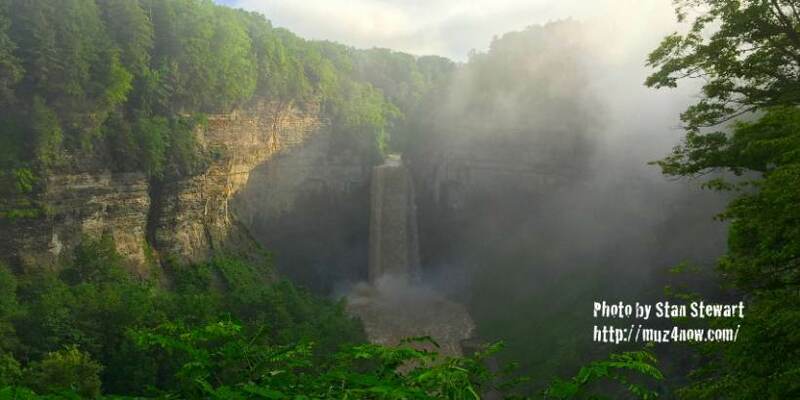 Huddled in one of the well-known gorges north of Ithaca, it is the namesake of Taughannock Falls State Park. To give you an idea of this spectacle: the waterfall drops 215 feet — the highest single-drop waterfall east of the Rocky Mountains. Since the park is only a few miles from my home, I frequent both the rim and gorge trails nearly every week when they are open. The result is that I take a lot of pictures of this spectacular waterfall and the surrounding areas. For the purposes of this pictorial blog, I’m presenting just a few of the photos I’ve captured of the Falls itself. As you can imagine, Taughannock varies throughout the seasons. One of the incredible and inspiring parts of this waterfall is the rocky gorge itself. As you view these photos, notice the changes in the rock face on either side of the falls. Here are two more samples for your viewing enjoyment. May you, too, find many inspiring visuals as you explore the outdoors of our wonderful earth. If you made it this far and want more, click on this sentence to see more of my Taughannock Falls photos. « We are humanity. Opt-In music video.